Dr. Scranton is an orthopedic surgeon in Seattle, Washington, serving both his private practice and as an Associate Clinical Professor at the University of Washington, teaching residents and students. From 1980 until 1997, he was the team physician for the NFL's Seattle Seahawks and served as President of the NFL Physicians Society from 1995-1996. His experiences with the NFL led him to write his new book, Playing Hurt: Evaluating and Treating the Warriors of the NFL. Dr. Scranton is also a well-recognized expert in the OATS procedure for replacing defective articular cartilage in knees, and he is currently the President of the American Orthopaedic Foot and Ankle Society. Knee1: Knees, ankles and hips. They all work together, so how can a current injury be indicative of a future injury? 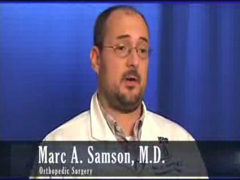 Dr. Scranton: There's no question that the knee and the ankle work together in terms of symmetry of gait. If you have someone, say, with a sprained ankle (or), and this is carrying it to the extreme, an individual who has a fused ankle, they can walk with a normal gait because of the ability of the knee and subtalar joint to completely cover that up. Knee1: Wouldn't that cause problems with the knees down the road? Dr. Scranton: That's exactly right. An individual who has a chronic ankle problem, their knee compensation for that eventually will be attritional. Somewhere between 5 and 15 years down the line of untreated compensation will lead to an attritional problem. And the same could be true for the ankle. I've had people who have major loss of motion of the knee with arthritic deterioration, and then they will start to have degenerative spurs form at the ankle because they're vaulting over their ankle to compensate for their knee. Knee1: If I have weak ankles, what can I do now to keep my knees as healthy as possible? Dr. Scranton: That's a really good question. There are reported in hospital emergency rooms and doctors' offices, (an estimated) 27,000 ankle sprains a day! This doesn't count how many go unreported. What I am leading up to (is) out of that number, the incidence of recurrent ankle sprains that would require surgery is extremely small, probably 1%. You would say, "Ok. If the incidence is so high, what characterizes the 1% that have chronic instability?" So there are certain things that you would want to look for. If you're a patient that has recurrent ankle sprains, then there are probably certain things that are probably wrong with you ankle that you're a set-up for ankle sprains, and you should be addressed by a doctor. The most common one is just that you have a varus heel–your hindfoot tends to turn in a little bit–and so as a consequence, you're biomechanically set up to roll your ankle. Knee1: Does the anatomical angle between your hips and knees predispose you to walking a certain way that could cause you to turn your ankle? Dr. Scranton: Yes. With respect to being set up for an ankle sprain, I would say someone who has internal tibial torsion and anteverted hips, their knees tend to point in, they will also on occasion, the ones who are recurrent ankle sprainers, will have a varus hindfoot, as well. So they tend to toe in. It's pure physics. Another anatomical variant is what's called the posterior fibula. About 70% of all people who come to surgery with an unstable ankle with recurrent ankle sprains, they have a fibula that is posteriorally positioned. So structurally, the ankle is more open and it's more vulnerable to sprains. What I am leading up to is … if you have an individual who is athletically oriented and has a history of recurrent ankle sprain, they probably have some anatomic predisposition to that. They should probably see an orthopedic surgeon for a biomechanical evaluation and then, for example, maybe should have an orthotic that has a 1/8-inch lateral wedge. It's those little biomechanical predispositions that could set you up in the long-term either for a knee problem or for arthritic problems in the ankle. The NFL Experience It really was matter of chance. I took care of the University of Pittsburgh for three years when I was an Assistant Professor at Pittsburgh. When I entered private practice here in Seattle … completely by chance, they also happened be the doctors for the [Seattle] Seahawks. In effect, it was by chance. It wasn't my intention to become the Seahawks' doctor, but it was actually my group's intention to recruit me on that basis. Knee1: What led you to write Playing Hurt: Evaluating and Treating the Warriors of the NFL? Dr. Scranton: I think that what I wound up seeing from 1980 to 1998 was a huge evolution in the way in which medical care was delivered to the players. From the, let's call it a "mom-and-pop" outfit where the Nordstroms originally owned the team and it was regarded as part of the community to it becoming a billion- dollar big business with agents, free agency, no team loyalties, and every injury being screened by the agent and the player being flown around for second opinions. For example, combine physicals. When I joined the club there were no combine physicals. And for the entire winter and spring quarter, promising college football players were flown around from camp to camp and the NCAA said, "This is stupid. These are students and you have no right to be doing this." So in essence, the combines evolved into all (teams) meeting for one week and all players that the NFL was interested in were flown there. Every club physician examined the players, and the strength coaches worked them out and the position coaches looked at them and the agents all showed up and negotiated. What I am leading up to is there was a huge spectrum of change in the 18 years from combines to the delivery of health care to the involvement of agents. I thought this was really fascinating … and the fact is no one knows what happened except for the "Old Guard," because most physicians don't last in the NFL longer than 6 or 8 years. They just burnout or a new owner comes in and fires them and gets their favorite doctor in. I thought I should write about this. The reviews have been extremely (good). People like it who have read it like it, and they've said, "Wow! These are really interesting things!" So it was fun! Knee1: How have you changed as a physician because of working with the coaches, players, agents and other physicians? Dr. Scranton: That also is an interesting subject because, for example, my good friend (and current President of the NFL Physicians Society) John Brown … wound up having a meeting with the NFL Players Association. They were actually shocked when they discovered that over half the NFL physicians did not pay for the right to be the NFL doctor. Because their perceptions were that the NFL doctors were just tools of management who were paying just to attach to the coattails of notoriety of the team. If you were to ask me what are the changes? I would have to say that probably for the first 12 years–up until 1992 when free agency came up–until that time, I had never had a player leave the Seahawks, ever, even for a second opinion. After that time, free agency arrived, and you would get a player who was an expensive free agent. When he would get hurt, he would not know who you were, he would not know who anyone in the organization was, so he would immediately call his agent and say, "I just hurt my knee. Where should I go?" The agent's and NFL Players Association's perception was, and rightly so in many cases, that the doctor on the team was just a tool of management. Free agency exacerbated that. On the flip side, there are the doctors who have no affiliation with clubs who specifically curie the favor of the agents. They fly them in in private jets. They have condos for them. They woo them and let them know how impartial their excellent care is. And then every time somebody gets operated on they hold a press conference and announce how they just saved a career. So it’s an economic battle out there at this point in time between teams who will sell the rights to provide healthcare to doctors and health systems and other doctors who will actively promote themselves in the media claiming that they are the best and they are not a tool of management. Knee1: Let's take (San Francisco 49ers Running Back) Garrison Hearst for an example. When do you say to a player, "Your career is over," or "You're career is not over, and I can fix you?" Dr. Scranton: I would say as a surgeon probably my two most-satisfying events in sports medicine were (reconstructing) Curt Warner's knee when he blew it out in 1984. And at that time, no one as a running back had ever come back in the NFL. And Garrison, who literally had been out of football for more than a year, who had had failed surgery, and had actually been advised to consider having his ankle fused and get out of football. You almost have a sixth sense about who is going to make and who isn't. When I met Garrison I knew he had the focus and intensity that he was going to make it. So I said, "Here's what your chances are, and this is what would be necessary to do it. And if you are willing to be 100% compliant, I think you have a chance to come back and play in the NFL." And there was zero hesitation on his part. He said, "Let's do it." And the rest really was history. For Garrison, as a person, I am very, very happy for him. He is a wonderful young man. And for myself professionally, it's sort of a crowning achievement to have world experts who have operated on him before, and it didn't work out. And then I intervened in an area where I have a lot of expertise and to do the right thing and make it work was very good. Knee1: Why is the NFL still playing on artificial surfaces if they are blamed for so many injuries? Dr. Scranton: The carpet has changed. The new surfaces have been scientifically designed to mimic earth. They have a sand base give to them. In some instances, depending upon if its indoor or outdoor, they have actual grass growing in between the artificial surface. The main purpose, at least in the high school level, is cost. If you are a high school and you have a football field, that football field will be destroyed at the end of one season. Whereas (with artificial surface,) many teams can practice on it. We did a comparison study (in 1997) that's printed in Foot and Ankle International, an analysis of 75 non-contact ACL blowouts in the NFL. And natural grass with cleated shoes is more dangerous than Astroturf. There are more injuries on Astroturf, but that is because there are concussions, turf toes (and) mat burns. But there is a higher incidence of a non-contact blowout on natural grass. We were shocked because we were expecting to prove conclusively … that Astroturf was dangerous. We figured, "Ok. If you get a concussion, that's not good. If you get a mat burn or an ankle sprain, that's not good." But the sickening injury, which threatens the career, is the non-contact ACL blowout. And what we found that in 52 injuries where we actually had game film and we could document the surface, playing conditions, the type of shoe, the incidence was 4 to 1 in favor of grass causing the injury. There were 40 non-contact ACL blowouts on grass in cleated shoes and 12 on Astroturf. We are entering a new age. I trained in academics and am the president of the Foot and Ankle Society and for literally decades there was a perception that if you had anything to do with industry you were dirty. Your ethics were impugned. What has happened is with the leadership of the people like Ron Sparks (President of Smith & Nephew Endoscopy) and other companies, they have recognized and the physicians have recognized that we can work together. They can't develop new products without input from the physicians that use them, and we can't get the things that we need if we don't at least talk to industry. For example, Ron Sparks and his company made a grant of $250,000 to the Foot and Ankle Society over five years and we'll be able to do research, education and take care of disabled children in Vietnam through his company's leadership and generosity. It's something that I think is an emerging trend. There is a change and a partnership with industry now wherein with appropriate arm's length agreements, we are more partners together in developing the products we need rather than each working in a vacuum. You can purchase Dr. Scranton's book, Playing Hurt: Evaluating and Treating the Warriors of the NFL, at Amazon.com.